Our Health Care Team is committed to providing the excellent care that you want for your best friend! Our Health Care Team welcomes you to our clinics in Greenville and Lakeview. Let us know how we can help you and your furry friends as we strive to serve you to the best of our ability. Dr. Blinkilde (seen here with three of eight St. Bernard puppies he just delivered by C-Section) is happily married to his wife, Karin, of 29+ years and has two boys Nathan and Matthew. Nathan is a graduate in Aerospace Engineering from U of M and works for Boeing in Seattle. Matthew just earned his Masters in Public Administration. 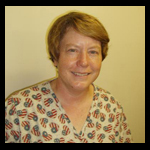 Dr. B. has worked at the clinic since 1982 and has been an owner/partner since 1984. 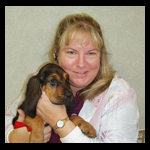 Dr. B. has a special interest in surgery of all kinds (especially orthopedics), English Bulldogs, reproductive medicine and surgery, and in talking with young people about animal care and veterinary medicine from first grade through high school. He especially enjoys the challenges that veterinary medicine brings. In his free time he enjoys playing with his dogs (Abbott and Skye), taking care of his cats (Andres, Nils, Anna, and Ella), woodworking, staying involved in his church, and Board Chair of the Greenville Area Community Foundation (http://www.gacfmi.org). He loves to travel with his wife and has had the pleasure of visiting many places all over the US and Canada with his family as well as having the privilege to travel to Israel and Rome. Dr. B. especially enjoys the challenge of helping our clients as well as our four-legged friends with behavioral, medical, and surgical problems. Dr. Edwards was born in Detroit, Michigan and grew up in the suburbs. His decision to become a large animal veterinarian was mainly influenced by his experiences on his uncle’s farm. He graduated from Michigan Technological University with a Bachelor of Science and Wildlife Biology degree. 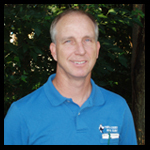 He graduated from Michigan State University College of Veterinary Medicine and also completed the Dairy Health Management Certificate Program. 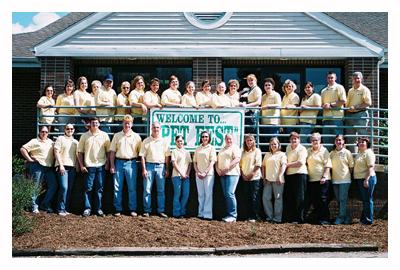 Dr. Edwards started working at Town and Country in 1988 and became an owner/partner in 1991. His hobbies include golf, basketball, playing the guitar, fishing, turkey hunting, and bird-watching. His favorite meal is his wife’s spaghetti dinner. He lives in Greenville with his wife Ruthanne, and two children, Ben and Hannah. His family also includes two dogs, Becky and Chloe, two cats, Gumby and Phoebe, and three fish, Oliver, Patrick and Whiskers. 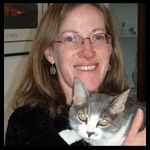 Received her Doctor of Veterinary Medicine degree from Michigan State University and specializes in Farm Animal Medicine. She and her husband Ned have a boy named Kaden. 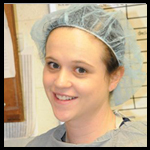 Dr. Austin is originally from the Chicago area, but moved with her family to West Michigan during elementary school. She graduated from Rockford High School and then received a Bachelor of Science degree from Aquinas College. 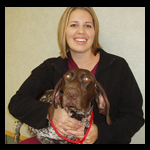 Dr. Austin then attended Michigan State University College of Veterinary Medicine, where she graduated in the top 5% of her class in 2004. 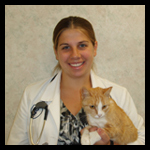 Dr. Austin joined Town and Country Animal Clinic immediately following veterinary school. Like all the doctors at our clinic, she provides a full range of veterinary services, but is especially interested in ophthalmology, soft tissue surgery and the diagnosis and treatment of endocrine diseases. She is also passionate about animal welfare and advocacy. Outside of work, Dr. Austin enjoys reading, creative writing and any form of exercise, especially yoga. She and her husband have a home in Greenville, where they are raising 2 and 4 legged children. Dr. Bastek is a graduate of Michigan State University. She enjoys the practice of farm animal medicine and helping our local dairy herds. 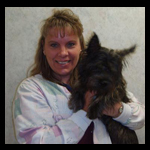 Dr. Scott enjoys socializing with people and the quality of life of our clients and their pets. She likes the challenge of strengthening the human/animal bond and the relationship our profession has in maintaining that bond. She was born and raised in Lowell and graduated from MSU in 2002. Dr. Scott is married, has two sons and many pets, both large and small. She enjoys spending time with her family, horse-back riding and gardening. Dr. Darden is a graduate of Michigan State University. 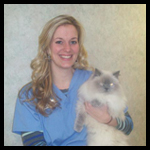 She enjoys the practice of small animal medicine and surgery and enjoys working with clients to help their pets. She has a hobby form with her husband and daughter. Dr. Kemperman lives with her husband Kurt and their daughter Clare. Karin is our bookkeeper. She takes care of 5 cats and two dogs. I have worked at Town and Country for over 15 years. I have always loved animals. Currently we have three dogs and three cats. My husband, Ron and I have been married for 37 years, have two sons, one daughter-in-law, three grandsons, two granddogs and one grandcat. What a wonderful family. I never get tired of interacting with all the pets and their owners that walk into the doors of Town and Country Animal Clinic. Erin graduated from Greenville High School and Baker College. She has a uniquely colored cat named George. Erin is especially interested in animal dentistry. She enjoys hiking, canoeing and target shooting in her free time. Kim has been with Town and Country since July of 2008. 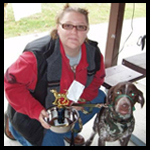 She attended Baker College, earning her license as a Veterinary Technician. She is an avid animal lover and is especially passionate about her birds. Kim and her husband, Frank, have two sons, Jason and Ryan. The family also consists of 3 dachshunds, 1 pomeranian and 5 birds. 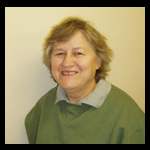 Kim's is very artistic-her hobbies include crocheting, painting and crosstitch. Kim is always ready to learn something new to enrich her life. Joanie and her dog, Oakley. Kendra enjoys the many facets of the veterinary hospital. 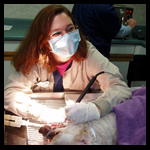 Whether she is assisting in surgery, speaking with clients, or doing treatments, she likes her position as a technician at Town and Country Animal Clinic. When she is not playing with her dogs, Kahne, Saldana and Summit, you can find Kendra rooting for her favorite Nascar and Sprint drivers. Kendra also has a love for hunting, target practice and pink guns. Jen is originally from Colorado. She also resided in Alaska for two years before moving to Michigan. 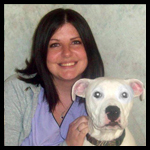 She has always been interested in Veterinary Medicine and working with animals. 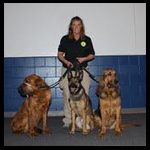 She is a member of Kent County Search and Rescue with her two Bloodhounds, Jed and Jake, and her Belgian Malinois, Anja. She is the K-9 training coordinator for the team. Jen graduated from the Belding Police Academy in June of 2003. 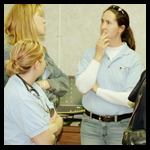 Since that time she has taken many classes through the Search and Rescue group including CPR/AED and first aid, search operations, search management, scent theory, missing person behavior and crime scene preservation. Jen also enjoys horses, gardening and reading. She has two daughters and two granddaughters. Mary was born and raised in Grand Rapids. Her educational experiences include some college classes and many job related seminars. She has over 30 years experience in secretarial work, telecommunications, finance, customer service, manufacturing, and health care. Mary's hobbies include reading, gardening, watching movies, and playing computer games. She has two sons, one daughter, four grandchildren, and three dogs (Rufus, Buddy, and Molly). 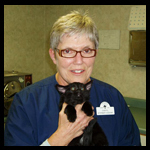 Lori has worked at Town and Country Animal Clinic since December of 2000. She and her husband, Paul, live in Vickeryville and have three children. Lori and Paul also have two dogs: a Retriever name Duke , a very active Lab named, Bailey and a cat named Fred, Lori's free time is spent crocheting rag rugs, reading or riding snowmobiles. Jackie grew up on a dairy farm and quickly became familiar with large animals. 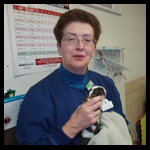 She enjoys animals of all sizes, which has made her job at Town and Country Animal Clinic fun and interesting. Walking, going to movies, and spending time outside with her children are Jackie's favorite activities. Jackie has two boys who keep her busy and happy. They each own their own dog, a black lab and a boxer. Erica and her husband have 2 girls. Erica likes to stay busy and truly enjoys the Health Care Team at Town and Country. She loves seeing all the puppies that come through our doors. Erica enjoys scrapbooking when she is not spending time with her children. The family has a guinea pig named Shiver and 2 dogs, Eli and Kobe. 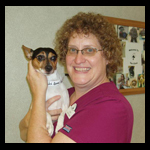 Having lived in the area for many years, Lisa sees many familiar faces at Town and Country Animal Clinic and always enjoys meeting new people. She and her husband, Dave, have two children and two grandchildren and a Border Collie, Butch. Lisa enjoys photography, sewing and crocheting and loves finding new projects to get involved in. Kathis has been married 30+ years and has four grown children. 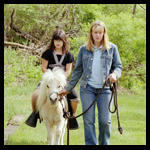 Kathie and her husband have four horses and she is very involved in the 4-H program. When she is not riding a horse, you may find her and her husband cruising on their newly acquired Harley Davidson. 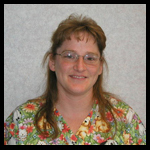 Carolyn is in charge of Farm Animal Operations at our Lakeview Clinic. When not at the clinic, Gina keeps herself busy spending time with her husband, two children, two cats and a dog. She and her family enjoy camping whenever it is possible. Jodie has a great love for animals. She has two dogs and five cats. She enjoys her pet experiences at Town and Country. She can love up the patients while they are here and doesn't have to adopt them all. Jodie has two daughters, Leslie and Alyssa and a boyfriend, Brad. Jodie and Brad are avid Nascar fans and love to go camping. 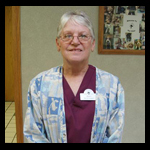 Diane brings with her a variety of skills and experiences, having worked full time 35+ years in a variety of clerical positions. She and her late husband were very active for many years in 4-H and raised two daughters on their farm. Diane now has 6 beautiful grandchildren who keep her very busy. She is active in her church, goes to college nearly full-time, loves doing crafts of all kinds and scrapbooking. Rascal, her dog, keeps her laughing. 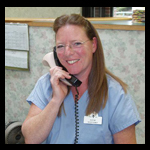 Angie is our receptionist at our Lakeview office and especially enjoys the customer care aspect of veterinary medicine. Judy lives in Coral with her three daughters who attend Tri-County Schools. Their four-legged family is made up of three horses, two dogs and a cat. Judy and her girls are involved in 4-H and soccer. 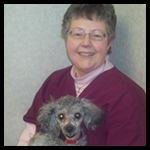 Judy is the kennel manager at Town and Country Animal Clinic. 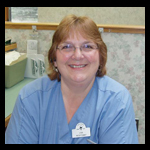 Julie grew up in Montcalm County and worked at Electrolux for nearly 27 years. When the plant closed, she attended MCC for an Associates Degree in Information Systems, where she maintained the honors' list. 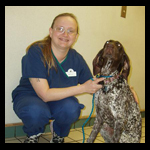 Following her schooling, she became employed at Town and Country Animal Clinic in the Kennels, where she is able to share her love with animals. Julie has two dogs; Rudy, a Springer Spaniel, and Scout, a Black Lab. Kathy has worked at Town and Country as a groomer since since 1995. Kathy's husband is very supportive of her interest in Shelties, which she has raised since 1965. The beauty of the Sheltie breed has inspired her to make sculptures, some of which have been used as prizes at Sheltie shows. Her love for her Shetland Sheepdogs led her to an interest in sheep and she now has 5 Shetland Sheep. Kathy learned how to use the spinning wheel to make yarn from the wool left from the sheared sheep. She has also spun dog hair. Kathy has a love for flower gardening, Classical and Christian music and butterflies. Kathy is a member of West Michigan Butterfly Association and participates in the annual July butterfly counts. Kathy and her husband have raised three daughters, who are now married and have added two grandchildren to their family.